I would like to know the translation of this Rockman's parts. The Kanji are way too small to identify them. You can copy and save it to your desktop and Paint will enlarge it for you. 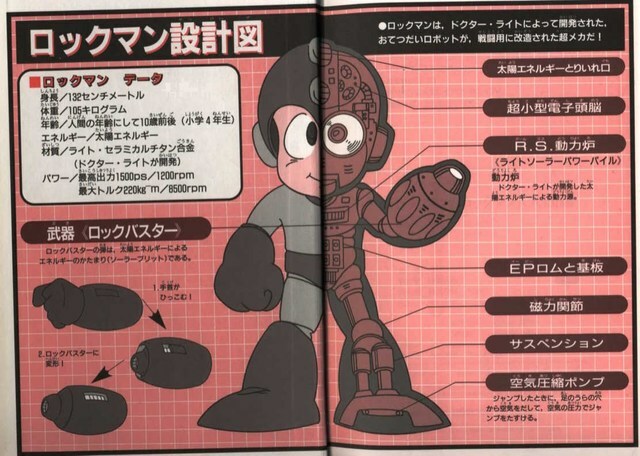 Rockman was designed by Dr. Light. He is a Super Mech that was modified from a Helper Robot into a Battle Robot! The Rock Buster's bullets are made of accumulated solar energy (Solar Bullets). 2. It turns into the Rock Buster! -A solar energy reactor developed by Dr. Light. When jumping, there's a hole on the bottom of the feet that disperses some air, aiding jumps via the air pressure. Many thanks and much appreciation. Thank you. Your name will be credit. Cheers! Credited? Is this going to go on a website somewhere or somethin'? No problem. It was fun. Oh, no. For my note with your credit in it. You know, some people claim this to be theirs and I don't so I like to be honest, that's all. It's not "Solar Fleet," BTW. It's "Solar Bullet." I just fixed my note.. Thanks Ryusui and DS as well. Cheers. By the way, please click above to enlarge an image. Thanks again. Wow. Thank you so much for your help. Just like DS... Can you write them in Japanese too?? Please ?? One more question... From Rockman & Forte. I read Auto's Shop.. Auto tells us about Japan and America words: Energy Balancer and Energy Balance. The Japanese word for Balancer in Dictionay is correct but why does the American version says Balance instead of Balancer ? Interesting words. Also, I think Ryusui is right that ブリット is likely meant to be "bullet". Unless you've got some reason to believe they're "brits"? Ah. Nope. My mistake. It's definitely "bullet". Can you write them in Japanese too just like DS?? Please ?? Wow.. You are so amazing. Thank you kindly! No, don't worry about it. I already take care of it.. thanks. Also, from Rockman & Forte. I noticed one thing about this game. I read Auto's (Rightot) Shop.. Auto tells us about Japan and America words: Energy Balancer and Energy Balance. The Japanese word for Balancer in Dictionay is correct but why does the American version says Balance instead of Balancer ? I'd say the correct phrasing would be "Energy Balancer". A "balance" is one of these things. It shows that two things are in a state of balance. A "balancer" would be something that puts things in a state of balance. The item, as far as I can tell, refills the energy of weapons that aren't currently equipped if you pick up an energy drop when your current weapon is already full. In other words, it puts all your weapons in a state of balance (all full). So, "balancer" is the correct term. Thank you very much. That's all I want from you. Cheers!